Arizona is a fantastic state for gold prospectors, and Phoenix is a great central location to many productive mining districts. There are many areas that gold can be found within just a short drive of the city. Phoenix is located in Maricopa County, which is the 5th leading gold producing county in the state. And to the north is Yavapai County, which ranks as the leader in gold production for the state. In both of these counties there is ample public land that is open to prospecting, and while the area has been hunted hard over the past couple centuries, there is still gold out there to be found. Many areas have been worked on and off over since the Spaniards first started mining here, but most mining started in earnest during the first gold rush in the mid-1800’s. The San Domingo and Little San Domingo placers are very productive areas that will produce both lode and placer deposits. This district is located on the southern flanks of the Wickenburg Mountains, and northeast of the Hassayampa River. This is the richest placer district in the Maricopa County. Southwest of the town of Wickenburg is a very important area that has been one of the larger mines in the state. The Vulture Mine was discovered when a large quartz outcrop showed to have high concentrations of gold. Ore was worked by an arrastra in the nearby Hassayampa River, which also had smaller placer deposits. The Cave Creek district is located about 25 miles north of Phoenix. Primarily a lode producer, a variety of minerals are also mined here. Placer can be found along Cave Creek and in various gulches here. Many areas in the Bighorn Mountains have gold. The mines are located south of Aguila about 15 miles. Several lodes are found in this vicinity, and the drainages often have accumulated gold deposits. Other noteworthy areas within Maricopa County are the Agua, Saddle Mountain, New River, Pikes Peak, Salt River, and Sunflower mining districts. To the north in Yavapai County there are even more areas worth exploring, and are still a reasonable distance from Phoenix. Lynx Creek is an extremely productive creek in the state, and also one of the most popular areas to search for gold. It has a reputation for producing some nice sized gold nuggets. Several miles of the creek are withdrawn from mineral entry, which allows prospecting without a claim. The Humbug district in the southwest Bradshaw Mountains is another excellent area to explore. Most of the creeks the drain the southern flanks of the Bradshaw will contain gold. 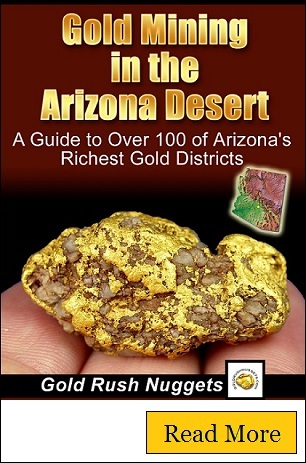 Rich Hill is a very well-known area that has produced some of the largest gold nuggets in the state of Arizona. East of Stanton in the Weaver Mountains are countless areas that will produce gold. At the top of Rich Hill is the famous Potato Patch Mine, which was called “Potato” due to the whopper nuggets that were found there. The placer area extends for miles around Rich Hill. Explore the many nearby mining areas. This area has been prospected hard, so consider exploring the fringes of the well-known district to find deposits that haven’t been mined yet. On the northern end of the Bradshaw’s is the Big Bug district. Many gold mines are located here, and evidence of historic mining is not hard to find. The Bagdad district is located 40 miles west of Prescott. Another productive area, it has produced significant amounts of both lode and placer. Other noteworthy mining districts within Yavapai County include the Black Canyon, Black Rock, Castle Creek, Cherry Creek, Copper Basin, Granite Creek, Hassayampa, Minnehaha, and Turkey districts. Due to the limited water most of the year, most prospectors in the Phoenix area find gold using two methods; metal detecting and drywashing. Metal detecting for gold can be especially fun, because of the potential to find gold nuggets. There are undoubtedly still thousands of nuggets out there waiting to be unearthed, and a metal detector is one of the best tools for the job. You can cover large areas and explore remote areas. With a detector, it is always possible that you could find an undiscovered deposit that is extremely rich. Drywashing is another method that is used throughout the desert southwest. These work well once a good gold deposit has been found by sampling. The drywasher is then set up and dirt is processed to extract the gold from the gravel. In the right areas, they can produce a great amount of gold. Many prospectors use them in conjunction with a metal detector for the best gold recovery. Phoenix is undoubtedly one of the best large cities in the U.S. when considering its proximity to rich gold country. While many folks have to drive hundreds of miles to reach productive gold country, Phoenix is located very close to many rich gold districts. There are many areas within an hour of the city that are very productive.